The People’s Republic of China’s encroachment into the Hoàng Sa archipelago began on January 16, 1974. The infamous standoff that ensued lasted until January 19, culminating in a fierce naval confrontation between the RVN and the PRC. On that day, under the orders of President Nguyễn Văn Thiệu, Vice Admiral Hồ Văn Kỳ Thoại and the South Vietnamese Navy opened fire on the Chinese warships, sinking one Chinese ship before losing one of their own in a battle that lasted less than one hour. Seventy-four South Vietnamese soldiers went down fighting in this battle. 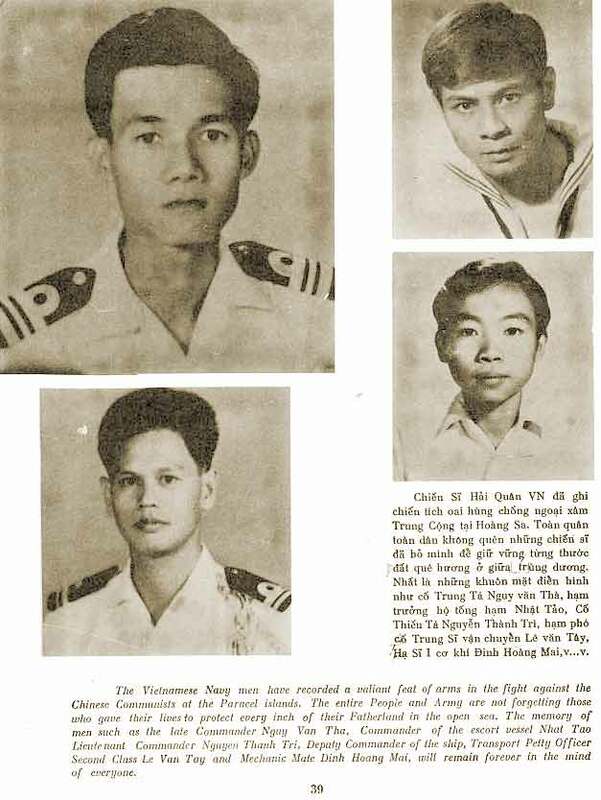 Among the fallen was one Captain Ngụy Văn Thà. Though it helped force the Chinese retreat, the Captain’s vessel, the Hải Quân 10, was too badly damaged for retrieval. As a final order, Ngụy commanded his troops to evacuate the sinking warship and return safely to the harbor. With the exit of his crew, the commander waited patiently for death, as two more PLAN ships were returning for him and HQ10. In his final hours, the commander was joined by two of his crewmen. Resolved to die alongside their fearless captain, the two sailors disregarded those orders to abandon ship. Along with two of his most loyal naval officers, Captain Ngụy Văn Thà went down with his faithful ship. His story signifies the greater sacrifice that the Vietnamese soldiers made in the name of freedom and independence. They knew they were outnumbered, and they knew they were were going to die. But even with that in mind, the soldiers of the South Vietnamese Navy went down fighting to the very end. They were patriots, fighting for their country and their people. The RVN Navy’s actions demonstrate that even though Vietnam is a small nation, it cannot and will not stand idly by while its larger neighbor tries to steal away its territory. In taking a stand against the Chinese, South Vietnam reinforced its sovereignty over the islands of Hoàng Sa. For future generations, this battle will be a symbol of Vietnam’s courage and resilience. The battle signified the defense of territory that has for centuries been under the control of the Vietnamese. Those soldiers that gave their lives did so with honor and courage. Their actions reverberate in the hearts of every Vietnamese patriot to this day, and will do so for decades, even centuries to come. Last week, I tried to encompass the significance of the Hoàng Sa Battles in one single post. Needless to say, that blew up in my face. I know full well that I can’t do these men justice here, because to fully encapsulate their courage and sacrifice in a single article is simply impossible. I couldn’t do it for Brother Việt Dzũng, and I sure as shoot won’t sure be able to do it here. All I can do here is make known the sacrifices that these soldiers have made for us all. With fierce and noble hearts, these soldiers did not yield to the Chinese threat. They fought, they made a stand, and they saw to it that the virtue of the Vietnamese people are forever enshrined in history. To that, I commend them. To the sound of 21 guns bursting into the ocean air, I honor the courage and sacrifice of these soldiers. We will remember, always. 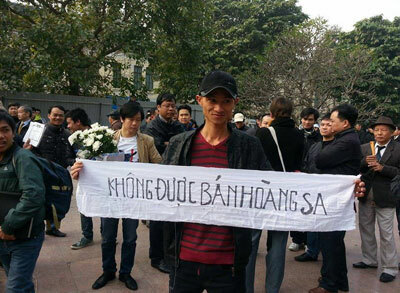 On Sunday, January 19, 2014, the people of Vietnam were barred by the VCP government from participating in the 40th memorial of the Battle of Hoang Sa, or the Battle for Paracel. In several key cities across Vietnam, the population planned and attempted to orchestrate large-scale gatherings to protest the forty years of Chinese occupation of the Vietnamese islands, which were invaded and taken by the People’s Liberation Army Navy from January 16-19, 1974. 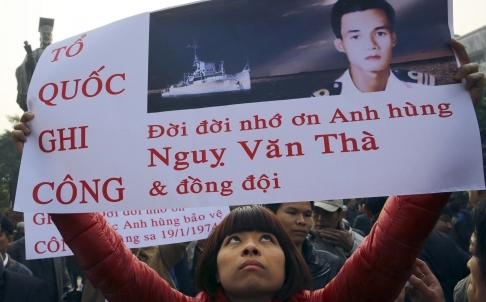 In Hanoi, under the monument of the ancient Emperor Ly Thai To, hundreds of Vietnamese protestors gathered with banners and flowers to honor the South Vietnamese soldiers who died protecting the Hoang Sa archipelago. Uniformed and plain-clothed/undercover policemen spectated the gatherings for a brief amount of time before dispersing the crowd and sending them home. Police officers disguised as construction workers sprayed dust in the air to make protestors uncomfortable on the grounds. They would eventually shut down the entire gathering, though avoiding the use of force to accomplish their job. In Saigon, the old capital of South Vietnam, residents were prevented from gathering altogether. 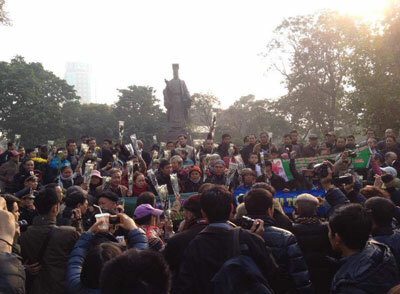 However, unlike in Hanoi, security forces in the south did resort to violence to prevent the Vietnamese people from staging any sort of protest. On January 17, 2014, a group of women who tried to protest China found themselves in a scuffle against the Communist policemen. Yeah, you heard right. The women tried to show love for their country, and the cops, being the true-hearted Communists that they are, sought to suppress patriotism and sought a fight against a group of women to prove their point. 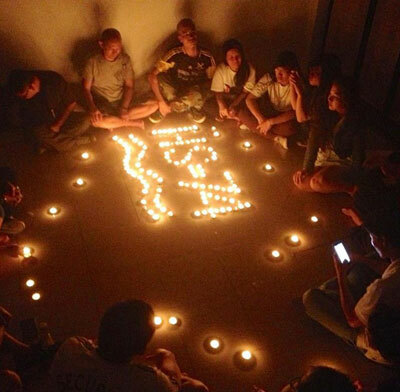 On January 19, due to the heavy suppression by the police, demonstrators had to gather within the walls of a church in order to properly pay their respects to the lost soldiers of 1974. In the coastal city of Danang (not pictured here), closest to the scene of the battle, a supposed state-sponsored commemoration of the 40-year memorial was scrapped by the government at the last minute. Let’s just state the obvious here and say that the government of Vietnam never intended to allow the memorial in the first place. They just feigned support for the dedication as a political maneuver to win themselves a shred of respect before the people, respect that they quickly squandered, as always. The local government in Danang planned an extravagant display with the supposed blessing of the central government, but at the last minute, the show was scrapped for “bureaucratic” reasons. The Danang government invested much effort into the project. Sadly, it will never see the light of day. In the earlier post, which no longer exists, I mistakenly suggested that Nguyen Tan Dung had planned to put the heroic exploits of the South Vietnamese soldiers into Vietnamese school textbooks. That point was inaccurate, as the Communist Prime Minister only wished to write that Paracel and Spratly belonged to Vietnam and that the Chinese wrongfully invaded. He had no intention of portraying the South in a positive light at all. I knew that first point was bologna when I jotted it down, but in my haste to complete the article for commemoration day, I completely botched the editing process and allowed for the ensuing fiasco. Well, I saw to it that the information is fixed, and that you can be confident in the information you are reading now. Nguyen Tan Dung’s comments, as tame and disappointing as they were, did in fact get censored and erased from public consciousness. Moreover, a television station in Dongnai Province, but not the entire country, did in fact provide coverage of South Vietnam’s heroic naval stand against the invading forces of the PRC. It was because of this coverage that Vietnamese people believed the government actually had a tiny shred of patriotism in them, and planned the anti-Chinese protests accordingly. Well, to our disappointment, and once again resonant with VCP behavior, Hanoi buckled under Chinese pressure, bowed their heads and betrayed their people. It is a sad reality, but it seems the Vietnamese Communist government will continue to be an impediment to the recovery of Vietnam, not the solution. This is just the first part of my commemoration for the Battle of Hoang Sa. It is meant to signify the disappointing reality that Vietnamese people continue to deal with in the Communist country. However, it also demonstrates the patriotism and courage of the Vietnamese people today, who are taking an increasingly strong stance against the Communist government. 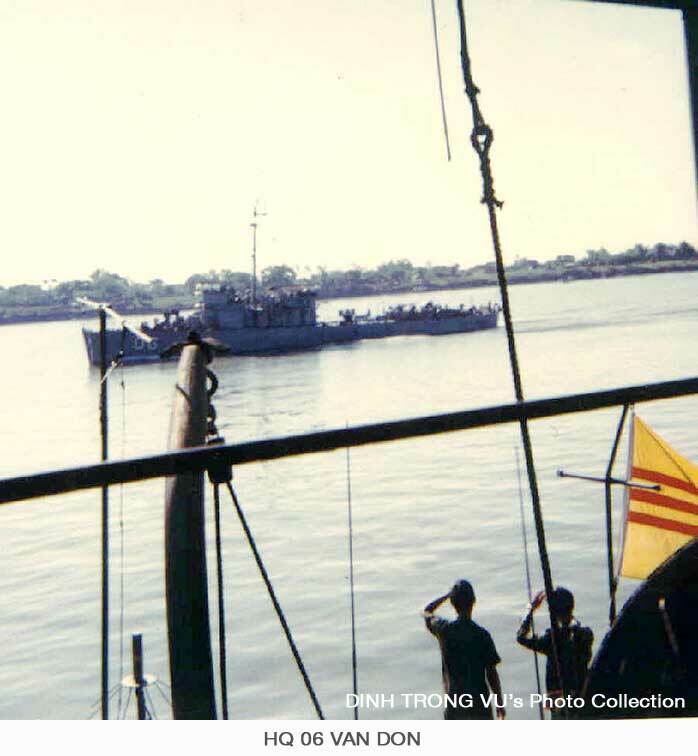 Another article will be written that truly commemorates the courage and sacrifice of the South Vietnamese navy. It will be there that we really discuss the significance of the battle and the brave soldiers that gave their lives for the country. Hang tight in the meantime. For my people in Vietnam, keep fighting the good fight, because all across the world, every red-blooded Vietnamese patriot is doing the same thing. One day, Vietnam will finally enjoy the liberty and justice that she truly deserves. Stand tall. Never waver. Onward. Oops! It seems that a major error has been made in this article and requires some key revisions. Subscribers to the blog, I advise you to delete the email version of this article, as a newly revised copy will be sent to you within the next day. If you decide to keep it saved, please disregard the information provided, as it may be misleading. My apologies, dear readers. A revised version of this same article will be released within 24 hours. Sorry for any inconvenience. I take full responsibility for the mix-up. I’ve decided to scrap the entire old article and write another memorial for the Battle of Hoang Sa. It will be broken up into several parts (either 2 or 3), and will take place over the week. Part 1 is almost complete and ready for publication. The first commemorative article is now available! The memorial will in fact be broken into two parts. The second article will be up in a day or two, maybe less! The second half of our commemoration has finally been posted. Sorry for the lateness, I do what I can in terms of time. It’s still Thursday where I am, so technically… Ah, forget about it. Enjoy the post everyone, and Chúc Mừng Năm Mới (Happy New Year) to you all!